I’ll repeat that: Tight Credit Is Causing Housing Prices to Rise. Yes I know. I’ll explain. 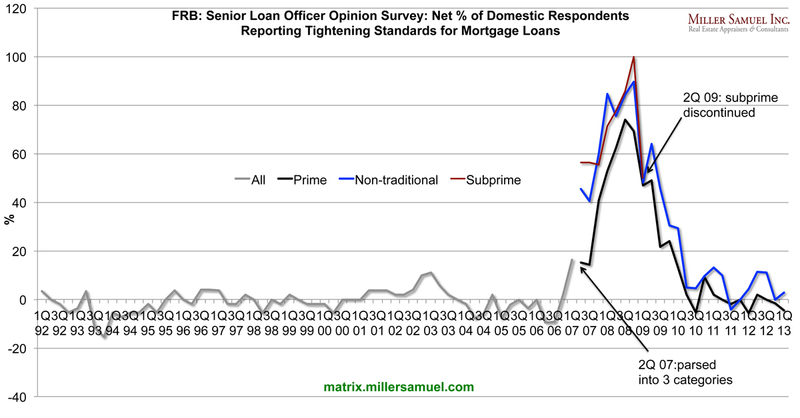 This week the Federal Reserve released it’s January 2013 Senior Loan Officer Opinion Survey on Bank Lending Practices and it continued to show little movement in mortgage underwriting standards but demand was up. The increase in demand has not softened mortgage lending standards. In fact, mortgage standards have remained essentially unchanged since Lehman collapsed in 2008. On the household side, domestic banks reported that standards for both prime and nontraditional mortgages were essentially unchanged over the past three months. Respondents indicated that demand for prime residential mortgages increased, on net, while demand for nontraditional residential mortgages was unchanged. Tight lending standards has prevented many sellers from listing their homes because they don’t qualify for the trade up, holding supply off the market. The shortage is manifesting itself by also keeping people unaffected by tight credit from listing until they find a home they wish to purchase. Record low mortgage rates keep the demand pressure on as affordability is at record highs. Rising prices are not really based on anything fundamental like employment and a robust economy. Tight credit + record low mortgage rates => reduced supply + steady demand => rising prices. Tight Credit Is Causing Housing Prices to Rise. As the credit world was unraveling around them, email communications between analysts at S&P seems to be pretty damming to their neutrality position. And finally now the lawsuit. There’s a fascinating re-write of the great Talking Heads song “Burning Down The House” by an S&P analyst. I’ve got the entire Talking Heads catalogue on my iPhone and I’ll bet that David Byrne and the rest of the ‘Heads never imagined their music would used to describe a global credit bubble. Wow. Their other songs like “Wild Wild Life”, “Road to Nowhere”, and “Psycho Killer” might have also done the trick. I was speaking at the New York Real Estate Bar Camp recently and asked the audience what to call the state of housing market right now, since I objected to the use of the word “recovery” and “a period of better stats without underlying fundamentals” wasn’t catchy. Philip Faranda came up (more like shouted out) a brilliant suggestion. We’re in a “Pre-Covery!” I loved it and it stuck. I thought about the new word when I read a great Robert Shiller piece in the New York Times this weekend called: A New Housing Boom? Don’t Count on It. It’s hard to pin down, because nothing drastically different occurred in the economy from March to September. Yes, there was economic improvement: the unemployment rate, for example, dropped to 7.8 percent from 8.2 percent. But that extended a trend in place since 2009. There was also a decline in foreclosure activity, but for the most part that is also a continuing trend, as reported by RealtyTrac. What’s missing from all the metrics being tracked and discussed is sharply falling inventory – that’s what is driving prices higher even though little else has changed. The reason for falling inventory? Sellers, when they sell, become buyers (or renters) and with >40% of mortgage holders having low or negative equity, they don’t qualify for the trade up. We have been so focused on negative equity that we’ve paid short shrift to the impact of low equity. Not only don’t many sellers qualify – they simply aren’t under duress i.e. they haven’t lost their job, don’t need to move, etc. so what will they do when they realize they don’t qualify? They expect/hope hope the market improves eventually. Although I certainly agree that the long term trend of mortgage rates doesn’t really correlate with housing prices since rates have been falling for years, weak employment and personal income are not justifying the last 6 months of housing market improvement. I see falling mortgage rates as simply keeping demand steady (but rates can’t fall much further) and falling inventory is either pressing prices higher or to stabilization depending on the market. The number of sales in a market rises 2%. The number of listings in same market falls 30%. In this scenario the rise in sales is NOT working off inventory – the math doesn’t work so something else is in play – low or negative equity is choking off new listings entering the market against steady demand caused by falling rates. To make this discussion really crazy we could even say that tight credit conditions are actually prompting the pre-recovery something that on the surface is very counterintuitive. But in reality, tight credit is choking off supply and low rates are keeping demand constant. Then prices rise. 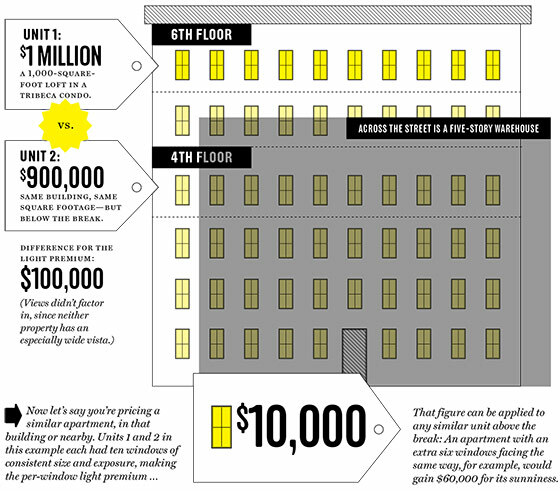 Prices by themselves don’t tell the story of affordability. Income has something to do with it. Candy bars were only 20¢ in 1978 but I was only making $2.65 at my college job. Catherine Rampell of NYT Economix blog posts a cool chart on the ratio of house price to annual household income from the IMF. 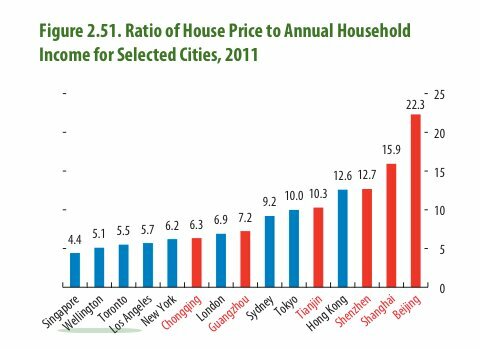 Housing prices are crazy expensive in Asia. As home sales pick up in the million-dollar-plus market, deals are being complicated by unexpectedly low appraisal values. The higher the price strata of the market, the smaller the data set is to work with so the conventional wisdom seems to be that less data = more unreliable appraisals. 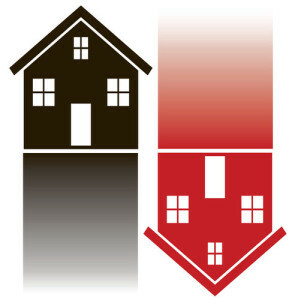 However I believe the real problem is lack of market knowledge by more appraisers today as a result of May 2009’s Home Valuation Code of Conduct (HVCC) – the lack of data at the top of the market merely exposes a pervasive problem throughout the housing market. To the New York Times’ credit, they are the only national media outlet that has been consistently covering the appraisal topic since the credit crunch began and I appreciate it since so few really understand our challenges as well as our our roles and relationship to the parties in the home buying and selling process. Appraising gets limited coverage in the national media aside from NAR’s constantly blaming of the appraisers as preventing a housing recovery (in their clumsy way of articulating the problem, they are more right than wrong). The general theme and style of coverage comes about when Realtors start seeing an increase in deals blowing up that involve the appraisal. The Prevost article indicates that higher end sales are more at risk because the market at the top (think pyramid, not as in ponzi) is smaller and therefore the data set is smaller. This may be true but I don’t think that is the cause of the problem but rather it exposes the problem for what it really is. I contend that the problem starts with the appraisal management company (AMC) industry and how it has driven the best appraisers out of business or pushed them into different valuation emphasis besides bank appraisals by splitting the appraisal fee with the appraiser (the mortgage applicant doesn’t realize that half their appraisal fee is going to a bureaucracy). My firm does a much smaller share of bank appraisals than our historical norm these days but it is NIRVANA and we’re not likeley to return to our old model anytime soon. Since the bank-hired AMC relies on appraisers who will work for half the market rate and therefore need to cut corners and do little analysis to survive, they generally don’t have local market knowledge often driving from 2 to 3 hours away. Throw very little data into the equation as well as a very non-homogonous housing stock at the luxury end of the market and voila! there is an increased frequency of blown appraisal assignments. There is always less data at the top of the market – the general lack of expertise in bank appraisals today via the AMC process is simply exposed for its lack of reliability. Unfortunately the appraisal disfunction affects many people’s financial lives unnecessarily such as buyers, sellers and real estate agents (and good appraisers not able to work for half the market rate and cut corners on quality). The appraisal simply is not a commodity as it is treated by the banking industry. The appraisal is a professional service so by dumbing it down through the AMC process, they have succeeded in nearly destroying the ability to create a reliable valuation benchmark on the collateral for each mortgage in order to be able to make informed decisions on their risk exposure. 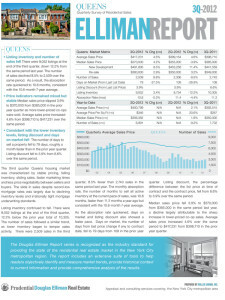 We recently published our report on the Queens sales market for 4Q 2012. This is part of an evolving market report series I’ve been writing for Douglas Elliman since 1994. Although year-over-year inventory slipped nominally, it was the lowest fourth quarter total in 7 years. Price indicators up from same period last year year. 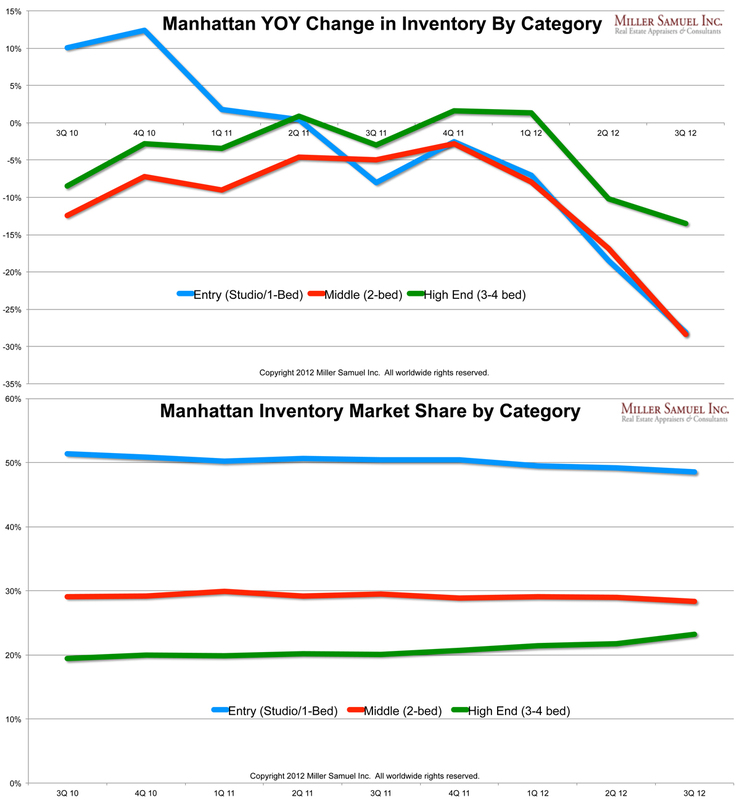 Number of sales declined from year ago levels restrained by limited inventory. 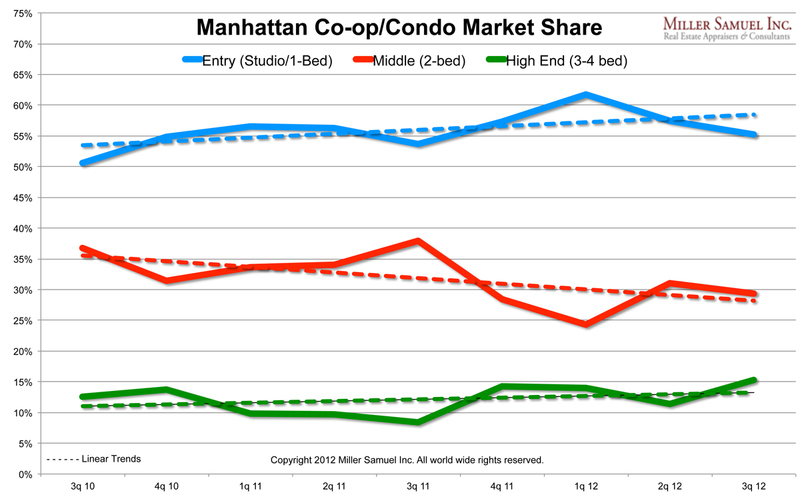 Luxury market prices rise but not at pace of overall market. Mortgage underwriting remains “irrationally tight” but record low mortgage rates and improving employment continue to drive demand. …In the final quarter of 2012, the Queens housing market saw a sharp year-over-year bump in prices, a modest slip in sales and listing inventory, shorter marketing times, and less negotiability between buyers and sellers. The historically tight mortgage underwriting standards continued to hold the impact of record low mortgage rates in check. Our Queens data tables are now updated for 4Q12 and charts will be available soon. 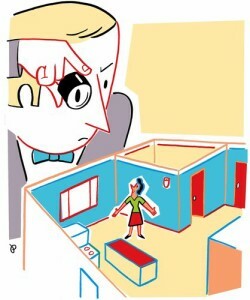 The New York Times Real Estate goes gonzo this weekend with a nice write-up AND a large color artwork on perhaps the least understood part of the home buying process. The appraisal. Can’t live with them, can’t live without them. “Sale and “Comparable” are not interchangeable terms. Really. There is no ratings category for (like totally) “super excellent.” The checkboxes provide good average fair poor with “good” at top end (but fear not, “super excellent” is marked “good” and like total adjusted for). Not all amenity nuances that are important to you as a seller (ie chrome plated doorknobs), are important to the buyer. Not all amenity nuances that are important to you as a seller, are measurable in the market given the limited precision that may exist. Not all appraisers have actually been anywhere near your market before they were asked to appraise your home, so technically they shouldn’t be called appraisers. Since their clients don’t seem too concerned about this, something like “form-filler” seems more appropriate. Most appraisers who work for appraisal management companies are not very good, but some actually are. When an appraiser makes a time-adjustment for a rising market, understanding whether a bank will accept that adjustment or not is (should be) completely irrelevant and quite ridiculous (unless they are “form-fillers” and not actual appraisers). I have always believed that the appraiser’s role is to provide an opinion of the value and that occurs in either flat, rising or falling markets. HVCC was a created with best intentions by former NY AG Cuomo by attempting to protect the appraiser from lender pressure, but it has literally destroyed the credibility of the appraisal profession by enabling the AMC Industry. The 12% deal kill average of an AMC an arm’s length sale properly exposed to the market is absolutely an unacceptably high amount and a major red flag for appraiser cluelessness about local markets. Back from a short self-imposed overwhelmed-with-year-end-deadline-work-blogging-hiatus. Hope everyone had a nice holiday. 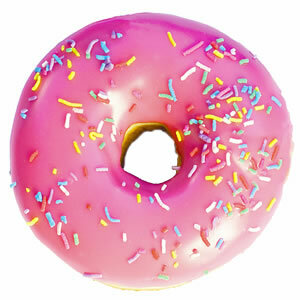 Michelle Higgins at the New York Times wrote a great piece weekend before last on the current stratification of the housing market that I call a “donut.” Strong on bottom, strong on top and weak in the middle. Mortgage rates are pulling in first time buyers at entry-level and high end is being driven high net worth and international buyers, leaving a weaker middle. The NYT editors weren’t very excited about my “donut” analogy even when I suggested a more New York City-ish bagel or bialy. However the piece correctly focused on the challenges the “trading-up” market in today’s houisng market. I had lunch with my friend Barry Ritholtz last week and he didn’t like my donut analogy saying it should have been a “barbell” – but seriously, can you put icing or frosting on a barbell? I thought so. A timeline that counters the national “recovery” discussion over the past year. Record low mortgage rates and held back distressed activity goosed housing sales and price up using year over year comparisons. I feel like I have to qualify myself as NOT being a housing bear (a distressed housing apologist) but I still can’t figure out the math: flat to falling incomes, high unemployment, rising taxes and tight credit = housing recovery? What’s missing? (memories of my contrarian sentiment feels the same as 2006, just not nearly so dire). 2010 (fall) – Robo-signing scandal combined with huge backlogs in judicial states causes a sharp decline in distressed sales entering the market in 2011. 2012 (1Q) Major servicer agreement with state attorneys general as distressed volume drops to its lowest crisis level. 2012 Calculated Risk and other respected sources call the bottom (and they may be right) but doesn’t factor in the distressed sale phenomenon. “Bottom” does not equal “recovery” but rather it’s a step on the way to recovery. 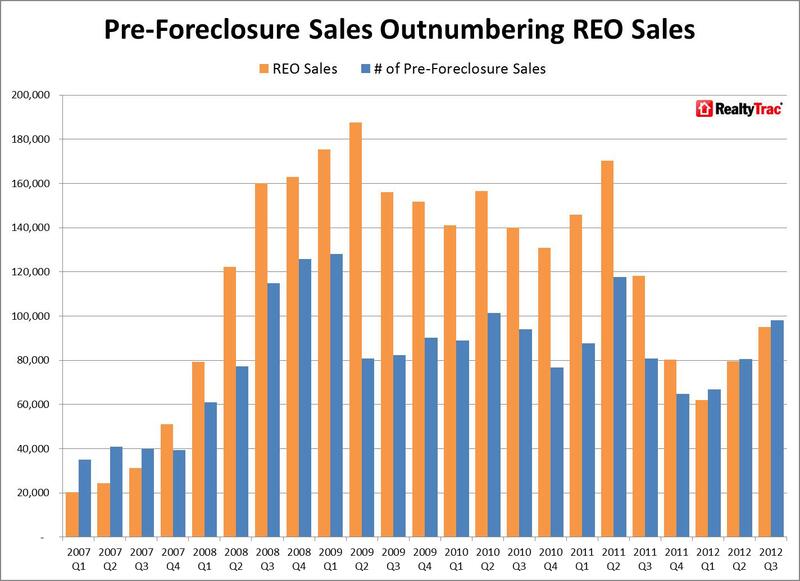 2012 (2Q) Distressed sales begin to rise again. By adding lower priced distressed sales in the mix, housing prices stabilize or slip next year nationally (I see Manhattan rising with low distressed exposure and limited inventory). Foreclosure levels need to resume their elevated levels or we simply don’t create a real, sustainable housing market recovery. We won’t see a tsunami like 2010 as short sales continue at their high levels and the courts are still backlogged, but I believe we will see a more distressed activity in the next few years than we did during the 2012 lull and that will offset rising prices . I’ve been remiss in not presenting the now week old interactive web page on the New York Times site called, alarmingly, What Could Disappear. I think Sandy brought this conversation front and center in NYC. The Bloomberg administration brought this issue up last year. 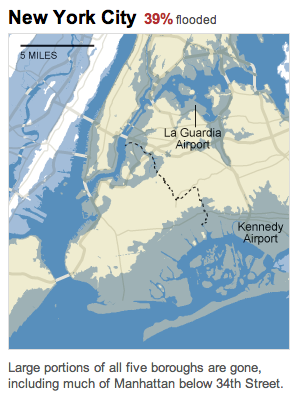 While we are talking hundreds of years for an ominous 25 foot increase in sea levels, it’s a wake up call for cities located in low lying areas. How does this impact the future of real estate in these areas? A lot is being made about the value of views these days. 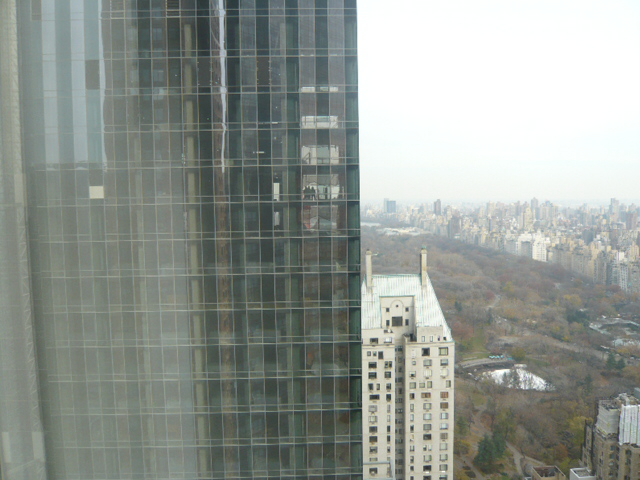 You can be on a very high floor and still lose a significant part of your view amenity as the following photos indicate. Views are nearly always discussed in the context of what is gained rather than what is lost. 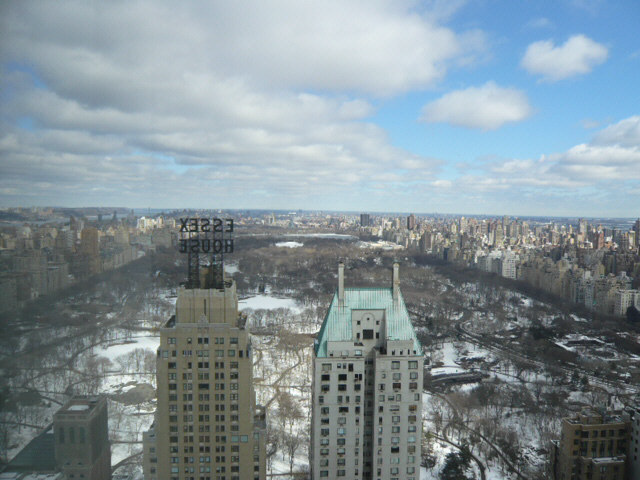 In NYC, no view is ever guaranteed. These were taken by one of my appraisers from the same spot from a high floor on a building across the street looking directly north over Central Park before and after One57 topped out.